As I said, I will release a new revision of the Buffalo shield that will have better support for the B3SE. The idea is to connect the photosensor side of one of the optoisolators directly to the IP_S header on the B3SE. 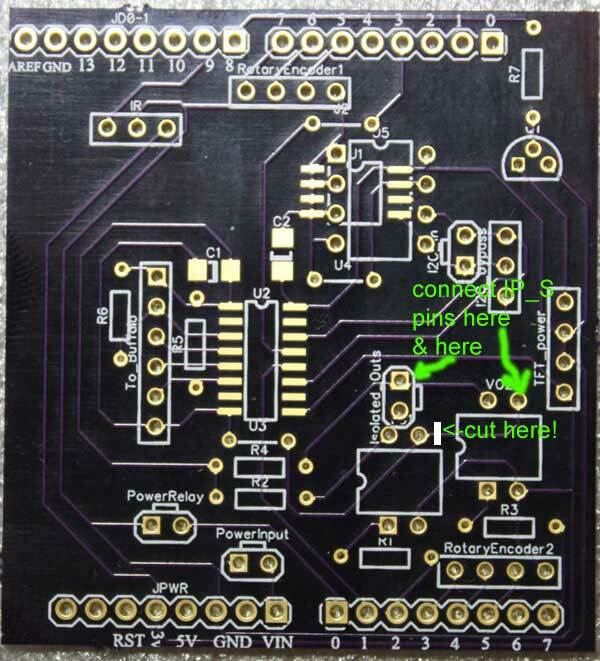 In order to do that, you will have to cut one trace on the PCB and solder directly onto one of the optoisolator’s pins. That’s pretty much it. On the new revision of the shield there will be a jumper where you have to cut the trace plus an extra pin so that you don’t have to solder onto the isolator’s pin. This entry was posted in Arduino, DIY Audio, TFT Hifiduino (shield) and tagged Arduino, buffalo, DAC, hifiduino shield by Dimdim. Bookmark the permalink.